Ruby loses against invisible Ars Technica benchmarks in the sky with unknown URLs! 72x slower than C! 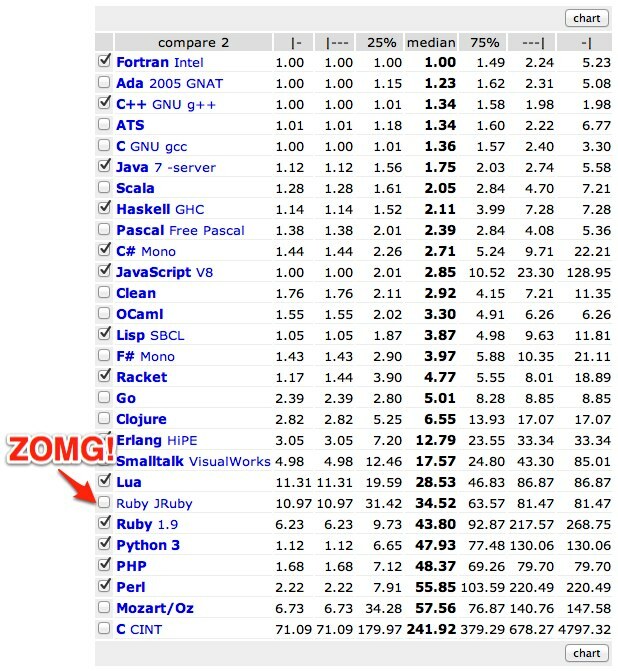 Over twice as slow as Python and Perl! Fortunately, we don't have to rely on some one-off benchmark Ars Technica may or may not have done at some indeterminate point in time whose URL cannot be located offhand, because there's a site with a fairly decent reputation which provides ongoing benchmarks across multiple programming languages using implementations submitted by fans of said language. It's been around for awhile and is relatively well-trusted. That site is the Programming Languages Shootout, and unlike the alleged Ars Technica benchmark, you can actually visit their web site at shootout.alioth.debian.org. What do they have to say about programming language performance? Yes, that's right folks: according to the Programming Languages Shootout, Python, PHP, and Perl are all slower than Ruby. Did you think Ruby was slower than Python? Guess what, you're wrong. Ruby used to be one of the slowest popular languages, but that has changed. Ruby performance has advanced considerably over the years, so if you're still repeating some offhand information you may or may not have gotten from Ars Technica at some point but can't find the link to as your metric of Ruby performance, you may want to try again, and find modern, relevant information you can actually get a link to. There are many future VM improvements in the pipe for Ruby, Python, and PHP (and I guess Perl users might continue dreaming of a Parrot-powered Perl 6). Rubyists can look forward to the upcoming JRuby 1.7 release which features InvokeDynamic support and allows for Java-speed method dispatch... in Ruby. InvokeDynamic is a game changer for the JVM in general, and it's a game changer for Ruby, because InvokeDynamic makes JRuby dispatch potentially as fast as Java. Python users can look forward to PyPy, which is posting some incredibly impressive numbers, especially around numerical computing. Python users can also look forward to resumed work on Jython, which is adding InvokeDynamic support which can potentially make Python as fast as Java. Finally, PHP users can look forward to the HipHop VM developed at Facebook, which will provide much improved performance for PHP. These are all great projects, but none of them are really ready for general consumption yet (including JRuby 1.7). All that said, the Programming Language Shootout doesn't include any of these unreleased development versions in the benchmarks you see when you visit their site. They show the numbers for the latest production releases, and those numbers show Ruby is faster than Python, PHP, and Perl. The game has changed: you just weren't paying attention. Last but not least, if you've seen some benchmark somewhere, even if you have an eidetic memory and remember but the numbers were, but can't even dredge up a link to it, please, please, don't quote said benchmark, even if you have an eidetic memory and remember what the numbers were. For benchmarks to be remotely scientific, they must be both reproducible and falsifiable, and hopefully in addition to both those things they have a good methodology. If you can't even dredge up a link to the benchmark in question, please don't go quoting numbers off the top of your head to people who might be influenced by them. Let's advance computer science beyond the state of witch doctors telling people to bleed themselves with leeches because at some point someone said they might make you feel better maybe. Comparing Python to Ruby directly, we see this chart: Python vs. Ruby. You can see that they are on the same order of magnitude, and to say that one is faster than the other is an illusion. They operate at the same speed when averaged over many different types of tasks. When Ruby is slow it's over 5X slower than it's median time. So the critical question would seem to be, how representative is the median timing of this test of real world use? C++ is always fast. PHP, at it's slowest, is only 2X slower than it's median timings. If the real world performance tends more toward the slower end then Ruby is slow. That means, your Browser is at least 12x faster then your webserver. Think it's a little unfair that the x86 architecture was cherry-picked of the four results sets to prove your point :/ on x64 quad-core, it was actually the slowest of all. I can't comment on the other languages' shootout implementations, but last time I checked some of the Ruby ones were astonishingly inept. I honestly wouldn't trust the aggregate rankings of the Shootout at all. I mean, I don't even know where to start in figuring out if this is efficiently implemented, but just look at it! Also, the shootout scripts were overhauled at some point. They used to be more general, and now they're much more focused on computation. That's part of why Fortran (which is optimized for mathematics) gets first place. I do agree that the conventional wisdom that Ruby is the slowest of the 'big four' (Perl, Python, PHP, Ruby) is unjustified. @djur They used to be more general, and now they're much more focused on computation. I don't think you know that. Because a good Fortran programmer wrote some programs, and perhaps because that's a good compiler. The real story: all of the good functional programming languages (which are way more expressive than scripting languages anyway) are 10-15 times faster than the scripting languages. @Will Buck -- You're letting Tony off too easily. @Isaac Gouy You want to talk about the multicore performance of Ruby versus Python? The "standard" interpreters for each of these languages have a GIL and thus don't support multicore. Multicore only really matters for JRuby, Rubinius, and Jython, as these implementations do not have a GIL and can thus leverage multicore with a single virtual machine. @Tony -- Here's a Python3 program that leverages 4 cores. @Isaac Gouy I was referring to the fact that the style is a mess and the author refers to himself as a "Ruby novice". I find the Python version of that test easier to read, and I've been using Ruby almost 10 years longer than Python. If that's your code and I hurt your feelings, I sincerely apologize. And yes, the shootout was formerly more generalized. I recall many more micro-benchmarks on things like object instantiation, recursion, function calls, data structures, etc. I'm going to wait for Fivetran. @djur If that's your code and I hurt your feelings, I sincerely apologize. You've already refered to the program author, so you know that isn't my name. @djur And yes, the shootout was formerly more generalized. I recall many more micro-benchmarks on things like object instantiation, recursion, function calls, data structures, etc. Things like method calls and object instantion are not more general -- they are specific to a particular style of programming. Things like ackermann and fibonacci and nested loops make the current tiny tiny programs seem like major exercises in software engineering! Lies. Damned lies. Statistics. And then whatever this is. Kids, if you can write it in Fortran, chances are you don't do it. Notice the author clear says that this is only: "Implementing an identical object oriented solution to the Josephus Problem(...) and measuring the performance results thereof." "After all, facts are facts, and although we may quote one to another with a chuckle the words of the Wise Statesman, 'Lies--damned lies--and statistics,' still there are some easy figures the simplest must understand, and the astutest cannot wriggle out of." While Ruby 1.9 got increased performance as seen in the benchmarks, I was more interested in the Lua, Go and C# numbers. Is sad C# haven't got much attention in the open source (outside Windows) world while having numbers like those. I'd be curious to know how Python 2.x fares in this benchmark. I have no idea whether it's faster or slower than Python 3.x, but 2.x is what I use most of the time. @dguaraglia -- I'd be curious to know how Python 2.x fares in this benchmark. @camel7k -- Is that a comparison of single byte ascii strings against double byte Unicode strings? In all cases if any of these languages were to make a change where my programming time was cut in half in exchange for their execution speed being quadrupled, I'd welcome it! Yes, Ruby is pretty fast, considering how dynamic and powerful it is, but it may just be too powerful. From what I've seen, Ruby developers very often tend to value inner library code beauty and nice outer API design over performance. Look at Cucumber for example, that is a two layers of DSL over regular Ruby code. People actually construct damn fat classes in runtime based on results of introspection ( that is slow ), nifty DSL's ( they are slow too ) and, of course, then they use string manipulation to build code, and later eval it. Also, things like long inheritance trees and breaking up code in modules make method lookup more complex, and if that is not bad enough, people use method_missing a lot, and blocks are everywhere. In the end, this gives us just insane Rails startup times, and people go around "Bundler so slow!". So while Ruby can be fast ( if you pay a lot of attention to optimizing the code ), most Ruby libraries are slow. And you will probably end up using them. That's a far more realistic analysis than just running over-optimized tiny bits of code. @anton: oh hell yes. Nicely stated. Benchmark squabbles tend to sound like the obsessions of medieval scholasticists, discussed with the wit and intellectual discipline of Redditors. "38 Python programmers can dance on the head of a pin!" "43 JRuby programmers can dance on the head of a pin!" "Not fair! Two of them only had one leg, so their footprint was smaller!" "Oh, so what about the PHP chick in a wheelchair, are we going to be ableist and exclude her too? Jerk"
"You know, Haskell is wheelchair-optimized. Any PHP v. Haskell wheelchair pindance benchmarks out there?" "Hey, the C# people totally cheat on their pindance benchmarks because the Macarena is not real dancing! "Lua is best for capoeira dance-off"
"What about line dancing? Lisp totally wins line dancing." "Only if you've got Moebius pinheads, which nobody uses in production." "Band name! Moebius Pinheads FTW"
More seriously, anton describes a far more realistic approach. I'd bet that well over 90% of real-world web apps would operate acceptably irrespective of the chosen language. Tautology -- Performance bottlenecks aren't significant unless they're significant. @Unknown: "where my programming time was cut in half". I'm a project manager, so on a certain level I think of developers and servers as costs. When the decision is about to hire Java developers for 2X in money or PHP/Ruby devs for X and if I can buy a HP DL360G7 with 2 CPUs (that is 8 cores at least, but can be 16) from 10 days of a PHP/Ruby developer's cost, what will I choose if the project has about 80 developer days? The PHP/Ruby one. When slow means "it cannot handle too many requests" then I don't care an inch if it is relatively slow. I'll just buy more servers. 3-5 years later - when I trash the servers - the next ones I buy will have ~24 cores, consume less power, and cost the same. Rubyists can look forward to the upcoming JRuby 1.7 release which features InvokeDynamic support and allows for Java-speed method dispatch... in Ruby. Well said Tony! I get so sick of people belching numbers and crowing. I much prefer the evidence, even if it didn't say Ruby was fast. Sometimes it's like "My Dad would beat your Dad in a fight any day!" playground mentality. In any case, I don't use my language of choice because it's fast, but because it gets the specific job I want done, done, and does it well. The fact that it is a pleasure to write (and think) in is a BIG bonus though. Có làn da trắng là mong ước của mọi cô gái , sản phẩm thuoc ivory caps giúp làm trắng da toàn thân ngoài ra bạn cũng có thể sử dụng các loại loai kem chong nang tot nhat. Ngoài ra nếu bạn muốn làn da luôn tươi trẻ thì nên dùng my pham sakura nhat ban như kem duong da chong lao hoa sakura giúp làn da luôn trẻ đẹp xóa các nếp nhăn. Cách thuoc herba vixmen an toàn và hiệu quả bằng herba vixmen , vậy thuoc herba vixmen mua o dau , có an toàn không và mua ở đâu sẽ được cho biết sau đây. Trung tâm luyen thi toeic cấp tốc uy tín tại tp hồ chí minh.Có địa chỉ tại võ văn ngân quận thủ đức. Nếu bạn nơi để mua do dien may cu thì hãy ghé qua địa chỉ sau http://thangghom.com/. Chúng tôi là nơi cung cấp các thiết bị điện máy cũ với giá cả và chất lượng hàng đầu. Khi bạn thắc mắc mua tủ lạnh ở đâu rẻ nhất tphcm hay nơi nào bán máy lạnh cũ giá rẻ? Thì bạn không cần phải tìm nơi đó nữa, hãy ghé qua thằng ghờm shop nơi bạn có thể mua máy giặt cũ tphcm, tủ lạnh, máy lạnh cũ tại tphcm với giá cả tốt nhất và chất lượng hàng đầu. Có thể bạn chưa biết hệ thống định vị toàn cầu gps là gì? Hãy ghé qua ngôi nhà kiến thức để tìm hiểu nhé. Đây là nơi tổng hợp các kiến thức hữu ích. Mochi (tiếng Nhật: 餅, もち) là một loại bánh dày nhân ngọt truyền thống của Nhật Bản làm từ bột gạo được dùng để ăn trong cuộc sống hàng ngày mà còn là vật phẩm dâng lên thần linh và có ý nghĩa mang lại may mắn. Bánh Mochi nhật bản là vật cúng không thể thiếu trong các gia đình Nhật Bản nhân dịp năm mới. Họ bày trí bánh dày Mochi ở hốc tường Toko-noma trang trọng trong phòng khách hoặc trong nhà bếp. Dịch vụ mua sắm khắp thế giới fado facebook, nhanh chóng, chi phí thấp, chuyên nghiệp. Trong phân bố trang tri noi that nhu cầu chúng có nét hài hòa tạo sự thỏa mãn, gần gũi, nhẹ nhàng với thiên nhiên. Trên thị trường hiện này có đông đảo noi that nha bep mây tre sử dụng trong xếp đặt noi that phong ngu cao cap phong phú chủng loại về hình thức và phong phú về giá trị ngân sách,tính năng dùng nhất là dùng trong noi that do go van phong . Tuy nhiên việc sử dụng đồ trang trí trong nhà may tre tại miền bắc thường gặp hiện tượng mối mọt bởi thời tiết ẩm ướt. vì thế tác phẩm đồ vật dụng trong nhà này chủ nhà phải lựa mua kỹ và gắt gao trong quy trình dùng từ đó tăng tuổi thọ cho tác phẩm tu bep , den nha bep .Ngoài ra để pha chế nội thất do noi that phong khach bạn có thể tận dụng nước muối làm sạch những vết bẩn trên ban an , ghe an , tu phong an khiến sợi mây thêm mềm mại, đồng thời hạn chế tận dụng chất tẩy rửa mang tính kiểm quá mạnh gây tổn hại đến nguyên liệu. Ngoài ra các thứ làm bằng gỗ, tre , mây hút nước khá tốt nếu để ngoài trời chúng bị ướt và tiếp xúc trực diện với ánh nắng mặt trời trọng một thời gian tuyệt tác đặc trưng như ghe sofa go , sofa doi , sofa 3 cho , sofa giuong , sofa goc , ke tivi , tu phong khach , den trang tri phong khach mau tu bep bang go , giường ngủ , tu go phong ngu siêu dể hư hỏng. OnOnPay là ứng dụng nạp tiền điện thoại online miễn phí qua Internet Banking (Hình thức thanh toán giao dịch Ngân hàng Điện tử qua Internet hay 3G) – Bạn có thể tải và cài đặt miễn phí app OnOnPay từ Apple App Store (cho iPhone hay iPad), hay từ Google Play (cho các smartphone dùng hệ điều hành Android như Samsung Galaxy, Nexus, LG…). Để tải ngay app OnOnPay trên Appstore Apple các bạn click tại đây hoặc tại đây khi có nhu cầu tải app trên Google Play. Tí Nị Shop là dịch vụ chuyên về in hình lên ly, in hình lên đồng hồ, in hình lên gối, in hình lên khung ảnh, in hình lên lót chuột, in hình lên ly sứ, làm tranh ghép hình. Đây là món quà cực độc đáo, sáng tạo cho bạn bè, người thân! liệu pháp giam dau benh da day hiệu quả tại nhà . Bài thuốc tây y mới chữa bệnh viêm gan b , Bạn tôi đã chữa khỏi viem amidan man tinh rồi ,Tôi đã cắt viem amidan mu song rất dễ chịu , Bài thuốc người dân tộc viêm đại tràng cấp tính . cần kiêng hay không kiêng benh dau da day nen an gi cho tốt . tìm hiểu thêm về trieu chung benh da day ra sao. ho do benh viem hong chữa được không , Tôi chữa benh amidan cho tre em rất tốt, Khi bị viêm amidan sau khi cat amidan kieng gi . Thuốc từ dau rong chua benh dau da day . Viêm mũi dị ứng hay trieu chung viem xoang . thuốc tây hay những bài thuoc dan gian chua benh da day bệnh mề đay ở người lớn và bệnh nổi mề đay ở trẻ em hay sảy ra không ?. Công ty Bình Lợi - chuyên bán và cho thuê cho thue cau banh lop với nhiều tải trọng của nhiều thương hiệu nổi tiếng khác nhau với giá rẻ và chất lượng ở khu vực miền Bắc. - Chúng tôi chuyên cung cấp đèn pha led , đèn led , đèn led siêu sáng, đèn led chiếu sáng, đèn pha led, đèn led , đèn led siêu sáng, đèn led chiếu sáng giá rẻ, chất lượng cao, bảo hành 24 tháng trên toàn quốc. Khi khách hang có nhu cầu mua hang trên toàn quốc. - Đồng thời chúng tôi còn là nhà cung cấp các loại nguyên liệu mỹ phẩm thiên nhiên như: bơ cacao, bơ ca cao, nguyên liệu mỹ phẩm handmade nguyên chất, cao cấp chất lượng có nhiều công dụng trong việc dưỡng da dành cho khách hàng, được đông đảo chị em phụ nữ ưa chuộng và sử dụng để săn sóc sắc đẹp của mình. - Nếu khách hàng còn gặp nhiều khó khăn trong việc chăm sóc sắc đẹp thì sản phẩm bơ hạt mỡ, bo hat mo, shea butter, nguyên liệu mỹ phẩm handmade nguyên chất từ tự nhiên có nhiều công dụng trong việc làm mềm mịn làn da, xóa tan vết thâm nám, đẩy lùi mụn cảm và triệt để xóa nhăn. Hãy cùng chúng tôi chăm sóc sắc đẹp của bạn, chỉ có bạn mới có thể tự chăm sóc cho bạn than của mình. - Sản phẩm tiếp theo mà chúng tôi sẽ giới thiệu cho các bạn đó là: bơ đậu phộng, bo dau phong , bơ đậu phộng ăn với gì, bơ đậu phộng bán ở đâu thơm ngon, cao cấp chất lượng có nhiều công dụng trong việc dưỡng da dành cho khách hàng, được đông đảo chị em phụ nữ ưa chuộng và sử dụng để săn sóc sắc đẹp của mình. - Ngoài ra chúng tôi còn là nhà cung cấp dịch vụ ăn uống khắp toàn quốc, đặc biệt là đặc sản cơm niêu, cơm niêu sài gòn, cơm niêu vũng tàu được đông đảo khách du lịch ưa chuộng và là điểm đến khi có nhu cầu ăn uống những món ăn ngon. - Và cuối cùng là một trong những dòng sản phẩm nhập khẩu cao cấp nhạp trực tiếp từ Úc và Mỹ: bột yến mạch, bot yen mach , yến mạch, yến mạch giảm cân thơm ngon, cao cấp chất lượng có nhiều công dụng trong việc dưỡng da dành cho khách hàng, được đông đảo chị em phụ nữ ưa chuộng và sử dụng để săn sóc sắc đẹp của mình. I am confused as to why the author does not believe that expressing complex sounds are thoughts. First off, saying a word out loud requires us to put together phonemes in order to create words. for example the word "cat" can be broken down into three distinct phonemes, /k/, /æ/, and /t/. So in other words /k/ cannot be said and the listener will understand that it means cat. Words are complex sounds that are grouped together in various ways in order to create comprehensible words. As in this example "cat" was the thought that the speaker wanted to convey. Also, there is a whole physiological side of how sounds are created. In other words, just because the thought you have is not complex, does not mean the the sounds are not complex. Also, language does not have to be written to exist. There are still tribes that do not have written language. Yet they still communicate with each other. Really i appreciate the effort you made to share the knowledge. This is really a great stuff for sharing. Keep it up . Thanks for sharing. This was a great and interesting article to read. I have really enjoyed all of this very cool information. Thank you so much for the post! Công ty cổ phần công nghệ Chí Đình được thành lập năm 2016 là một trong những công ty chuyên cung cấp về lĩnh vực ..
- Máy tính tiền TOPCASH AL Kiểu dáng thiết kế đẹp, sang trọng, chắc chắn. - Giao diện đơn giản, dễ sử dụng. - Bàn phím thiết kế: 112x2=224 phím bán hàng nhanh, 28 phím chức năng. Cân điện tử Mettler Toledo là Lựa chọn cân 6kg hoặc 15kg, 8000 PLU ,in nhiệt với tốc độ 110mm/sec, khổ giấy nhiệt tối đa 58mm, bàn phím nằm, màn hình hiển thị : Trọng lượng/Đơn giá/Thành tiền, kết nối RS-232, Ethernet, Wireless (option). Cân điện tử, in tem nhãn METTLER TOLEDO - bPro C2 Compact là Lựa chọn cân 6kg hoặc 15kg, 8000 PLU ,in nhiệt với tốc độ in 110mm/sec, khổ giấy nhiệt tối đa 58mm, bàn phím treo, màn hình hiển thị : Trọng lượng/Đơn giá/Thành tiền, kết nối RS-232, Ethernet, Wireless (option). Thích hợp sử dụng trong siêu thị, trung tâm phân phối, cửa hàng rau, trái cây… Lựa chọn kiểu màn hình : MÀN HÌNH LCD MÀN HÌNH DOT MATRIX. Việc sử dụng các dòng sản phẩm máy in hóa đơn vào kinh doanh buôn bán cho các mặt hàng shop thời trang hay tạp hóa, siêu thị là điều dễ hiểu, điểm nổi bật của loại sản phẩm Epson này là có thể sử dụng vào các mô hình kinh doanh ăn uống oder nhà bếp. Điều này khá mới mẻ và tạp nên đặc trưng riêng cho dòng sản phẩm này. + in nhiệt trực tiếp và thả- trong tải giấy. + nhà sản xuất chuyên nghiệp. - Công nghệ in nhiệt tự động, in trực tiếp lên bề mặt giấy một cách nhanh chóng mà không cần mực hay các phương pháp hỗ trợ nào khác. - Tự động cắt giấy khi kết thúc quá trình in. - In êm, không gây tiếng ồn, không làm khó chịu cho cả khách hàng và người sử dụng. Đối với máy in hóa đơn, bộ phận quan trọng nhất chính là đầu in nhiệt. Đầu in bị hư đồng nghĩa với việc mua một máy mới vì chi phí thay đầu in rất tốn kém và nhiều dòng máy không có đầu in riêng để thay thế. Vì thế bạn nên cân nhắc sử dụng giấy in nhiệt có chất lượng tốt một chút để tránh hại đầu in của máy in. KP-C9 với chế độ in nhiệt, đầu in Seiko(Japan). Đầu in chất lượng Nhật Bản giúp cho máy có chất lượng in tốt hơn, độ bền cao. + Độ nhạy sáng 0.1 Lux@F1.2. + Hỗ trợ: Giảm nhiễu DNR, Hồng ngoại thông minh, Phát hiện chuyển động (Motion Detection). + Tiêu chuẩn ngoài trời IP66. + Nguồn vào 12 VDC. Datalogic Group là một nhà sản xuất hàng đầu máy đọc mã vạch , máy tính di động, cảm biến, hệ thống quan sát và khắc laser. Sản phẩm được sử dụng trong sản xuất, hậu cần và vận tải, cũng như trong lĩnh vực bán lẻ. Datalogic SpA được trích dẫn trên các chỉ số FTSE Ý STAR của chứng khoán Italia kể từ năm 2001 dưới biểu tượng DAL.MI. Máy đọc mã vạch Honeywell là loại máy tốt nhất hiện nay,công nghệ hiện đại, tính năng ưu việt, tiên dụng cho người sử dụng, tiết kiệm công sức, thơi gian . Hai mươi năm sau khi thành lập của chúng tôi, các sản phẩm ZEBEX đang có sẵn trên toàn thế giới; chúng tôi hỗ trợ các nhà phân phối trong mỗi lục địa (trừ Nam Cực). máy quét ZEBEX và máy tính cầm tay được nhìn thấy trong gần như mọi ngành công nghiệp. Chất lượng cao là trung tâm của tất cả các phần của ZEBEX kinh doanh. Máy in nhiệt Dataprint đang là sự lựa chọn tốt nhất,nhiều nhất với mọi mô hình cửa hàng ,shop thời trang , cửa hàng thuốc, thực phẩm sạch,quán ăn, quán cafe, siêu thị mini, cửa hàng tạp hóa ....Tiết kiệm không gian quầy hàng. Dễ dàng sử dụng và thiết lập cấu hình như máy in thông thường. Phần mềm thiết kế , in mã vạch nhiều tiện ích QLabel IV hỗ trợ in từ CSDL kèm theo máy miễn phí. + In trên giấy thường, polyeste. + Bộ vi xử lý 32 bit. (Chạy ổn định, sắp đặt dễ dàng). + Độ phân giải: 203 dpi. + Bộ nhớ: 8 MB RAM, 4 MB Flash.Cổng kết nối USB và RS 232. + Công nghệ in : Công nghệ "Twin-sensor"
Máy in mã vạch Datamax-Oneil E4204 là dòng sản phẩm máy in mã vạch để bàn mới của Hãng Datamax – O’Neil, được thiết kế để đáp ứng và tiết kiệm chi phí trong các ứng dụng và hầu hết các ngành công nghiệp. + In truyền nhiệt trực tiếp và gián tiếp. + Bộ nhớ: 128 MB Flash/ 128 MB DRAM. Máy In Mã Vạch Honeywell PC42T sở hữu cấu hình mạnh mẽ với bộ nhớ tiêu chuẩn 64MB Flash 64MB SDRAM, công nghệ in nhiệt trực tiếp hay gián tiếp cùng đầu in nhiệt độ phân giải 203dpi, tốc độ in lên đến 101.6mm/s với in chiều rộng 104.1mm. Honeywell PC42t dòng máy in mã vạch siêu thị hỗ trợ cổng giao tiếp USB, Serial và Ethernet dễ dàng kết nối với các thiết bị đầu cuối như máy tính đẻ bàn, máy bán hàng POS hay laptop. Công ty TNHH chuyển giao công nghệ DTC Việt Nam chuyên cung cấp các sản phẩm công nghệ điện máy nhằm thu hút khách hàng.Sản phẩm máy in mã vạch Antech 2200E là dòng sản phẩm nổi tiếng với công nghệ cao. Bra dán cánh tiên được làm bằng chất liệu vải su và silicone mịn màng nên khi sử dụng tạo cho bạn gái cảm giác mịn mát, thoải mái. - Thiết kế cải tiến, không cần dây đeo, có độ bám dính cao cho cảm giác thoải mái, mát mẻ mùa hè. - Hai miếng dán có khóa cài để cố địnháo, không xê dịch khi di chuyển hoặc hoạt động mạnh. - Với Bút xóa vết bẩn quần áo Dong- A công nghệ Hàn Quốc, bạn không cần phải lo ngại các vết bẩn vô tình dấy vào người, làm bẩn trang phục. - Cách sử dụng dễ dàng: làm ướt chỗ cần làm sạch, sau đó dùng bút tô lên vết bẩn, dùng khăn ướt lau lại vài lần đến khi vết bẩn biến mất hoàn toàn. - Sản phẩm có kiểu dáng như một chiếc bút bi thông thường, rất tiện lợi mang theo để sử dụng bất cứ đâu. - Đèn Led để bàn có kiểu dáng hiện đại, thời trang, mang phong cách của dòng điện thoại iPhone. - Gồm 24 bóng đèn led công suất lớn, giúp cung cấp đầy đủánh sáng cho bạn. - Thiết kế nhỏ gọn, thông minh, có thể gấp nhỏ lại khi không dùng đến. - Thích hợp để làm đèn học hay đèn làm việc cho học sinh, sinh viên, nhân viên văn phòng. - Hoạt động thông qua hình thức sạc pin, thời gian sạc là 7-8 tiếng. Khi sạc đầy, đèn có thể sử dụng liên tục từ 8– 12 tiếng. - Dụng cụ bào sợi rau củ giúp cho công việc nấu nướng trở nên nhanh chóng và dễ dàng hơn rất nhiều. - Thiết kế đơn giản với 2 đầu giúp bạn bào củ, quả thành sợi nhỏ với 2 kích cỡ khác nhau. - Dụng cụ còn hỗ trợ bạn làm nên những món ăn ngon, đẹp mắt. - Tên sản phẩm: Kệ để đồ đa năng 4 tầng. Sản phẩm giúp bạn sắp xếp giày dép thông minh & Tiết kiệm diện tích hiệu quả. Chất liệu nhôm bọc hoa văn không rỉ. - Mặt kính cường lực trong suốt bền, đẹp. - Màn hình hiển thị rõ nét, tự động tắt sau vài giây nếu không sử dụng. - Cân sử dụng pin lithium 3V nhỏ gọn (có kèm pin). - Sản phẩm Dép bông Smilingdép bông Smiling cute cực kỳ dễ thương đi trong nhà nâng niu và giữ cho đôi chân bạn luôn ấm áp đấy. - Mẫu mã phong phú và đa dạng, màu sắc bắt mắt sẽ khiến cho mùa đông về trong căn nhà bạn trở nên ấm áp và rực rỡ hơn. Trong nhà bạn có nhiều đồ dùng cá nhân, đồ chơi của bé hay quần áo chuẩn bị đem giặt mà không có chỗ để? Hãy mua ngay chiếc giỏ đựng quần áo kiêm giỏ đựng đồ đa năng hình thú cực đẹp, đáng yêu và ngộ nghĩnh này nhé! Kệ để giày dép đa năng 4 tầng. - Ba lô có kích thước vừa phải, không quá to để bé cảm thấy nặng, trễ vai. Chiếc ba lô xinh xắn này cực kỳ tiện dụng để đựng đồ khi cho bé mẫu giáo đi học, đi chơi. - Chiếc ba lô xinh xắn này cực kỳ tiện dụng cho bé trai và bé gái khi đi học, đi chơi với bố mẹ hay bạn bè. Chất liệu vải da gai không độc hại, vừa bảo vệ được đồ vật bên trong khỏi mưa ẩm, không bị mốc, ố, dễ lau chùi, vừa giúp bé giữ được ba lô sạch sẽ, lúc nào cũng như mới. Ngoài việc hỗ trợ rèn luyện thể chất, đồ chơi bóng rổ còn giúp các bé đang độ tuổi đi học có thêm thời gian thư giãn bổích sau những giờ học căng thẳng. Bệnh vảy phấn hồng không chỉ gây ngứa ngáy mà còn làm mất thẩm mĩ ở da bằng đó mà điều trị bệnh vảy phấn hồng như thế nào vừa dùng biện pháp an toàn, chất lượng là nỗi băn khoăn của phần lớn người bệnh. Nội dung bài viết hôm nay ban biên tập website phòng khám y học cổ truyền Cộng Hòa sẽ trình bày qua bạn đọc cách thức điều chữa trị vảy phấn hồng hiệu quả nhất hiện tại. – Thương hiệu nước hoa nổi tiếng, với nhiều sản phẩm nước hoa chinh phục người dùng ở khắp nơi trên thế giới. – Nước hoa Dior có hương thơm dịu nhẹ đầy lôi cuốn, giúp bạn trở nên quyến rũ hơn. – Mùi hương lưu giữ lâu. - Đèn chiếu sáng cảm ứng hồng ngoại thông minh Light Angel (Trắng) gồm 7 chiếc bóng đèn LED nhỏ bố trí xung quanh cho khả năng chiếu sáng cao. + Sản phẩm tích hợp sẵn chao đèn và sensor cảm ứng, tự động bật đèn khi có người đi vào vùng cảm ứng, và tắt khi không có người sau 5 phút. - Có miếng dán tiện lợi kèm theo dễ dàng gắn ở mọi vị trí. + Các dụng cụ làm đẹp là những món phụ kiện làm đẹp quan trọng của các chị em phụ nữ. Nó phát huy tối đa công dụng của mỹ phẩm giúp chị em cảm thấy tự tin hơn với gương mặt của mình . – Có thể chiên (rán) 2 mặt bằng cách lật chảo, sau khi chiên (rán) giữ được nguyên hình dạng thức ăn. – Khi chiên (rán) Thịt, Cá cần rất ít dầu mỡ hoặc ko cần vì khi rán tự thịt cá có thể tự sinh ra mỡ. – Lông cọ được làm từ lông cước chất lượng cao thế hệ mới, lông cọ mịn và bám phấn tốt hơn hẳn những loại cọ cùng chất liệu lông cước thông thường. - Lông cọ được làm từ lông cước chất lượng cao thế hệ mới, lông cọ mịn và bám phấn tốt hơn hẳn những loại cọ cùng chất liệu lông cước thông thường. Nước hoa sang trọng hương thơm nồng nàng, say đắm, mang đến phái nữ sự tự tin, quyến rũ mỗi ngày. - Nịt bụng giảm mỡ Hot Shapers Hot Belt được làm bằng sợi Neotex độc đáo công nghệ nén cao an toàn cho sức khỏe, giúp làm tăng nhiệt độ cơ thể khi tiếp xúc với da, ra nhiều mồ hôi hơn. + Đai nịt bụng Hot Shapers là một sản phẩm hoàn hảo để tập thể dục, cho các thói quen hàng ngày bình thường, hoặc cho bất kỳ hoạt động thể chất. - Chăn lông thỏ Fashion Classic được sản xuất với sự giám sát nghiêm ngặt bởi các chuyên gia và công nghệ nhật bản nên bộ bền sản phẩm luôn đảm bảo sử dụng lâu năm, cùng với đó là độ ấm nhanh và luôn cực kỳ tuyệt vời. - Túi xách là vật dụng luôn đi bên cạnh các bạn gái mỗi khi ra đường . Tuy nhiên để lựa chọn một chiếc túi xách ưng ý lại không phải là điều đơn giản khi mà thị trường có quá nhiều các mẫu túi xách với đủ các hình dạng khác nhau . - Bạn muốn có một chiếc túi xách hợp túi tiền với một phong cách riêng biệt ? Hiểu được điều đó chúng tôi mang đến cho các bạn gái một chiếc túi xách hình nón. - Túi đựng điện thoại không chỉ giúp phái đẹp thể hiện phong cách trẻ trung, năng động của mình mà còn giúp bảo vệ cho chiếc điện thoại tránh khỏi va chạm, trầy xước, bụi bẩn. Túi đựng điện thoại được làm bằng chất liệu simili giả da mềm mại với họa tiết caro đẹp mắt, đường may đẹp, kiểu dáng và màu sắc thời trang. - Quần lót không phải là trang phục để thể hiện phong cách hay cá tính nhưng nó có ảnh hưởng rất lớn tới phong thái của bạn. Nó là một vật nhỏ nhưng sức ảnh vô cùng lớn, nó có thể khiến bạn thấy thoải mái. - Bạn luôn mất tự tin khi diện những chiếc váy ngắn, quần ôm sát bởi những đường hằn không đáng có, bên cạnh đó cảm giác bị gò bó, ngứa ngáy do những đường chỉ may của những chiếc quần lót thông thường. Your blog is really nice and unique.I like it so much. Looking forward to going over your web page again.Thanks for sharing with us. , you have shared good article. It will help me in great deal. have good content to link to then those links will do you no good. Máy hàn online la nha cung cap chuyen nghiep với nhiều sản phẩm của may han que hong ky va các loại may han tại tphcm voi gia canh tranh, chiec khau cao. if you wanna know something more tracking then please visit. Chuyên nhận in card visit giá rẻ, in card visit . So great work for informing us of the possibilities and following a certain path. Nice one.. Informative! Thank you for the post..
Các chủ tàu vỏ thép dịch vụ vận chuyển hàng hoá bắc nam ở Bình Định bức xúc nói rằng họ đặt niềm tin vào cơ quan đăng kiểm của Nhà nước, chi phí đăng kiểm tính vào giá thành con tàu, nhưng cuối cùng ngậm đắng vì tàu chanh xe gui hang di Ha Noi nhanh hỏng! Đưa chúng tôi xem bản hợp đồng đóng tàu chành xe đi Sài Gòn với Công ty TNHH một thành viên Nam Triệu (Bộ Công an), ông Trương Hoài Khánh, chủ tàu vỏ thép BĐ 99279 TS ở TP Quy Nhơn (Bình Định), nói chua chát: “Chúng tôi lần đầu tiên vay một khoản tiền cực lớn để đóng một con tàu vỏ thép thue xe tai chuyen hang gia re Ha Noi, nghĩ là chắc chắn, bền vững. Toàn bộ quá trình thi công đóng mới tàu thue xe tai TpHCM phải có sự giám sát của cán bộ kỹ thuật bên A và cơ quan đăng kiểm. Kết thúc mỗi điểm dừng kỹ thuật, bên A, bên B và cơ quan đăng kiểm tiến hành kiểm tra, nghiệm thu khối lượng hoàn thành, chất lượng công trình đóng mới tàu van chuyen hang hoa Da Nang gia re. Bên B thực hiện các thủ tục về đăng kiểm với cơ quan đăng kiểm, đảm bảo tàu chuyển hàng đi Hải Phòng giá rẻ được cơ quan đăng kiểm cấp đủ giấy tờ pháp lý để đưa tàu vận chuyển hàng đi Nha Trang giá rẻ vào hoạt động ngay sau khi bàn giao. Rồi khi chạy thử đường dài chành xe Gia Lai khoảng 2-3 hải lý, đăng kiểm viên cũng có mặt. Tôi không hiểu sao họ không phát hiện ra những chiếc máy chính lắp trên tàu chuyen hang di Ha Giang của chúng tôi là máy bộ cải hoán thành máy thủy, để dẫn đến thiệt hại như bây giờ - ông Khánh nói. Về máy, nguồn tin cho hay ngoài các máy Mitsubishi nghi là dùng máy vận chuyển hàng đi Thái Nguyên giá rẻ bộ cải hoán để lắp cho tàu vỏ thép do Công ty Nam Triệu đóng, tổ thẩm định còn phát hiện một số máy phát điện dịch vụ vận chuyển đi Bắc Kạn dán mác Mitsubishi và Cummins nhưng ruột không phải hàng chính hãng! بواسیر یک بیماری پر نشانه است که تشخیص آن از روی علایم نه تنها برای پزشک معالج بلکه برای خود فرد نیز در صورت آگاهی داشتن از آن بسیار ساده است. البته باید این نکته را در نظر داشت که ممکن است علائم بواسیر بسته به میزان آسیب آن، از فردی به فردی دیگر متفاوت باشد. این احتمال نیز وجود دارد که نشانه‌ها دلیل بر بیماری دیگری در فرد باشد. پس از بستن باند لاستیکی پزشک متخصص بواسیر به منظور تداوم درمان بواسیر به بیمار خود توصیه می‌کند با مصرف مایعات فراوان و موادغذایی ملین به حرکت بهتر روده‌ای و پیشگیری از یبوست کمک کند. با خرید گل و سفارش دسته گل از قاصدک گل های زیبا و باکیفیت را می توانید از گل فروشی ما سفارش بدهید. ما آماده ارائه انواع گل ها با قیمت مناسب برای مناسبت ها و جشن های شما هستیم. خرید گل و سفارش دسته گل و سفارش جعبه گل از طریق سایت آنلاین گل فروشی ما یکی از بهترین و آسان ترین راه ها برای خرید گل است. زنان به طور طبیعی دارای سایز و شکل سینه‌ی متفاوت هستند. سالانه هزاران نفر از زنان برای اولین بار تحت جراحی پروتز سینه قرار می‌گیرند و عده‌ای نیز پروتز سینه‌ی مصنوعی تهیه می‌کنند. بسیاری از زنان نگران ظاهر بدن خود پس از از دست دادن همه یا بخشی از سینه هستند. برخی از زنان ممکن است احساس کنند که با استفاده از پروتز شکل طبیعی بدن خود را از دست می‌دهند و این موضوع برای آنان بسیار ترسناک و ناراحت‌کننده است. thnaks for sharing, nice post. Kaspersky Total Security is a complete security solution for your PC which will protect your systems from threats, malware, viruses and etc. It will protect your devices from online threats, fraud, and online banking transactions and also encrypt the large range of data. Thank You for sharing such a great information!! Here is all about jio phone. Dell Customer care Number provide the support to their user if any one is having some problem then he or she can share your problems here. Pemilihan tukang ganti kain sofa bandung yang tepat memang dapat membuat ruang keluarga atau ruang tamu terlihat semakin service kursi jok bandung. Oleh karena itu pemilihan sofa yang cocok dan berkualitas untuk rumah idaman Anda memang perlu diperhatikan. Jika salah memilih sofa minimalis murah bandung akan berakibat sofa cepat rusak dan membuat Anda terpaksa mengeluarkan uang hanya untuk memperbaiki sofa atau bahkan harus membeli sofa baru. Tentu banyak kerugian yang akan di akibatkan bila salah memilih furniture murah di bandung salah satunya waktu atau kebutuhan uang yang tak terduga. Nah untuk itu berikut ini kami berikan langkah-langkah dalam memilih toko furniture murah di bandung supaya Anda tidak salah memilihnya. Dapur bisa dikatakan sebagai jantungnya rumah kitchen set murah bandung. Tempat di mana Anda biasa memasak, menyiapkan makanan, tempat berkumpul dengan keluarga saat makan malam, bahkan seringkali Anda mengawasi anak-anak yang sedang bermain atau belajar dari ruangan ini kitchen set bandung murah. Hal ini menjadi salah satu alasan mengapa sering kali harga kitchen set bandung menulis tentang bagian rumah yang satu ini. Tujuannya tidak lain adalah untuk memberikan Anda ide untuk dapur yang nyaman kitchen set bandung harga, indah dan tidak membosankan. Berbicara soal bikin kitchen set bandung, mari simak 10 ide dapur nyaman yang tak mungkin Anda lewatkan berikut ini. Buku Panduan Lengkap Kehamilan cetakan pertama bulan Oktober 2013. Alhamdulilah, sampai saat ini cetakan buku kelima di tahun 2015 buku cara cepat hamil dr. rosdiana ramli spog. Salah satu masakan unik yang membuat orang barat keheranan dan takjub saat berkunjung ke negara kita adalah sambal ikan roa enak. Ya, aneka resep masakan sambal ini memang khas negara kita dan disukai oleh hampir sebagian besar masyarakat Indonesia. Bahkan sebagian besar dari kita bahkan merasa kurang saat menyantap hidangan tapi tidak ada makanan sambal roa semarang. thanks for the sharing with us. Very good article about python, a good future ahead who opt for python as their career. Join in best institute like Tek Class to reach your career goal by acquiring skills on python, Informatica MDM Training , RPA, Salesforce Online Training . It is a very informative post. It really helps us a lot. Technical support may be delivered over by phone or a tool where users can log a call or incident. Larger organizations frequently have internal technical support available to their staff for computer-related problems.